In 1994, I was a sophomore in high school with two years’ experience as a bass player and practically a lifetime interest in music. At this point in time, though, the classics I’d been brought up on like Judas Priest and Black Sabbath had already gone through one mutation in which heavy Thrash bands and proto-Death Metal like Slayer and Sepultura were added and then another one which was more recently spearheaded by Entombed and Carcass. It was around this time as well that my reading habits changed, becoming wholly devoted to religiously reading Metal Maniacs, the only outlet that actually covered the bands I cared about. I’ll never forget my introduction to Amorphis, seeing the band reviewed in the ‘zine’s pages. It was for their album, Tales from the Thousand Lakes that they were reviewed and even more than the atmospheric Death Metal described, I was drawn in by the vivid blues used to illustrated the night-time vision of the lakes adorning the cover. As soon as I could get to the mall, I picked it up, and I was immediately struck by the fact that the music sounded like what was implied by the cover. I was instantly a fan and listened to that album over and over on my Walkman. On top of having such an awe-inspiring, enveloping sound, the band managed to finely tool their craft more and more on each album that followed. As each musician became more accomplished, the fans were greeted by the auditory evolution of their talent. Fans still pining for a return to the band’s early Death Metal sound (I’d love that too as I still have a “Tales from the Thousand Lakes” back patch on my jacket!) 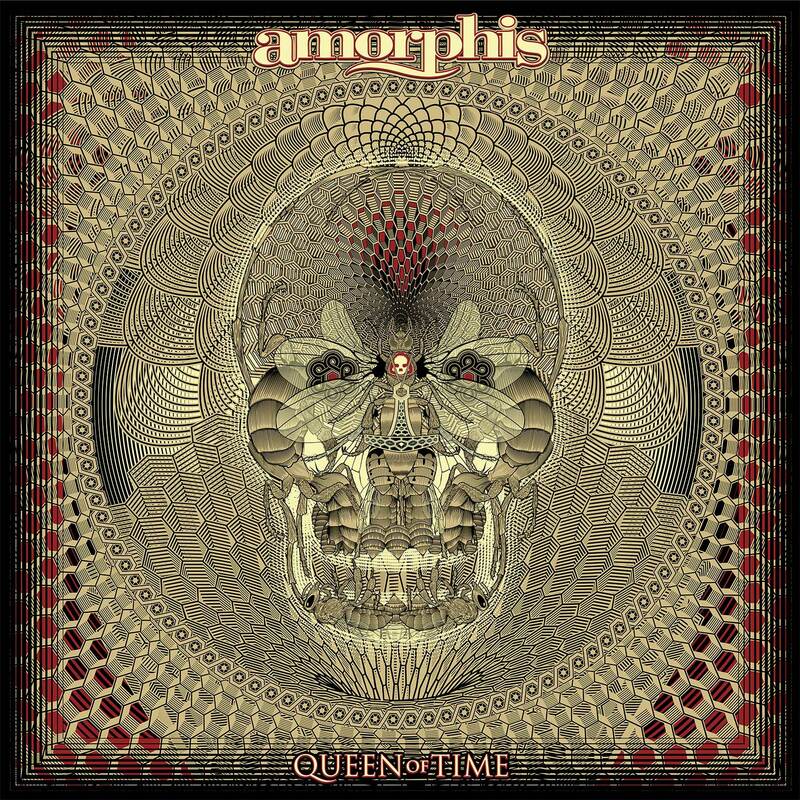 can probably hang it up for Amorphis have now existed longer in their current form; however, if going back to classics like Elegy and, more recently, Skyforger pleases your Karelian urges, then Queen of Time should amply impress. Simply put, it’s an amalgamation of all of Amorphis’s best traits including gargantuan riffs, spiraling keyboard melodies, and that genuine other-worldly feel attached to all the band’s output, perhaps their most endearing trait. “The Bee,” the album’s first single, is also the perfect opener for Queen of Time as it features a gradual build-up, in the beginning, developing into one massively fierce riff. It’s one of those huge rhythmic/melodic combos that enlists all fans of Metal and is sure to please the die-hards as well. The third track, “Daughter of Hate,” begins with a classic Amorphis melody being introduced, expanded up, and then reined in for the verse section. Various passages of saxophone deliver alternate takes on the main melody espoused by guitar and keyboard. The following song, “The Golden Elk,” is initially similarly developed to tracks off Elegy with its reliance on deep, soulful guitar and infectious melodies. A true exposition of Santeri Kallio’s keyboard talents appears in his orchestration in the middle soon followed by a jaw-dropping acoustic fingerstyle solo by Esa Holopainen. “Heart of the Giant,” the sixth track, continues the mature, polished momentum that is truly unrelenting. One feels moments of epic proportions with the use of choir and the late 1970s Prog-influenced keyboard solo later in the track. The eerie sound of the choir in the middle of the eighth track, “Grain of Sand,” embellishes with ethereal ambiance then giving way to double bass locked in with the guitar’s riffing adding just enough aggression for the transition. It is after repeated listens that the highlights above were written, and to add to that, the same highlights continued to appear in my notes, a testament to the impact of the album. Amorphis are one of the few bands whose reliance on the wah-pedal is not an irritant for they have fully incorporated it into their sound, personalized with their own style. The same can be said for other effects such as the heavy use of delay as well as using flange and phaser to put modular emphasis on key parts. Amorphis have perfected the crafting of their sound with a guitar tone that delivers heavy and melody equally well and classic yet inventive keyboards that know when to lay down the atmosphere and when to take the lead. Vocalist Tomi Joutsen has carved his own path in Amorphis by excellently alternating between a smooth, melodic vocal delivery and harsher tones that have the intensity of classic Death Metal but the clarity and tonal definition refined in a way similar to Paradise Lost’s Nick Holmes, though all his own. Whether singing, growling or screaming, the lyrics always come through with sufficient clarity and stunning articulation. When added to the tight rhythm section and overall ability to succinctly craft musical motifs that invoke myriad scenes and moods, largely helped by the diverse keyboard parts used, the above elements make Amorphis, without a doubt, an entity of quality songwriting and musical astuteness. The Pink Floyd and Deep Purple influences that have always pervaded the band’s core sound (at least since their first major departure from Death Metal with 1996’s Elegy) are perfectly melded with modern Metal in a way all their own. It is clearly evident the band have full creative control over this release because of the ten tracks, seven are over five minutes, allowing the band to fully develop their musical ideas. It is refreshing, captivating, and awe-inspiring to have followed the band’s career for close to twenty-five years now and continually be impressed with the maturation evident throughout their catalog. Having constructed such an original, heavy, yet accessible repertoire, it is a puzzling mystery why the band seems to garner no radio support. They could truly be one of the most talented and original bands to have come from Extreme Metal if allowed to exhibit their craft on the air. Queen of Time is indeed one of the most distinct, refined, and rewarding pleasures of this year’s releases. On May 18th, the album releases, and coupled with a good stereo system or headphones, a bottle of wine or beer(s), a smoking preference, and a vivid imagination, could result in the ultimate Friday night for fans of Metal everywhere.